The Dual-Mass Flywheel (DMF), plays a crucial role in absorbing torsional vibrations with its integrated spring and damping system and is usually the first port of call when there are unusual noises. Here, ZF Aftermarket experts explain how to identify the possible cause of an unusual noise; before exchanging the component unnecessarily. The DMF consists of a primary and a secondary mass and is located between the transmission system and the engine. The two flywheel masses are separate but connected via a spring and damping system, and mounted in a slide or groove bearing, allowing rotation. The torsional vibrations generated by the engine are reduced and largely separated from the rest of the driveline, resulting in less noise and increased ride comfort. When unusual noises suddenly occur, the suspicion quickly falls on the DMF and it’s not uncommon for it to be replaced without further inspection. Replacing the DMF is not only costly and time-consuming but often completely unnecessary as the cause lies elsewhere. For this reason, the experts recommend thorough investigation before removing the DMF. Firstly, carry out a test drive. If you hear unusual noises when you start the engine, it may indicate a defective DMF, but it could also be due to the engine cranking speed being too low. Other causes include poor starter performance and low battery voltage due to oxidation or corrosion of the electrical contact surfaces. To rule this out, ZF experts recommend a professional clean, using a special cleaning system it has developed to quickly clean affected electrical contact surfaces. Another possible cause of noise could be defective bearings in the belt tensioner freewheel. It is reasonable to suspect a faulty DMF if the noises occur during normal acceleration and gear changes and to determine this, accelerate the vehicle in a high gear above idle speed from around 1,200 rpm with constant full throttle. If there are no banging noises, unusual vibrations or vehicle bucking, the DMF can be largely ruled out. Engine diagnostics can provide additional information, including the measurement of engine starting speed and the injection quantity regulation. Cylinder-specific values of the idle resting regulation can indicate incorrectly operating injectors. If they are vibrating, it can overload the DMF, especially operating at full-throttle. The same applies to imprecise engine control, which can be caused by incorrectly adjusted timing gears on the belt drive. Tests can also identify faults directly in the engine control unit (ECU) as well as changes caused by chip tuning, both of which can damage the DMF. After the test drive and engine diagnosis, perform a visual and mechanical inspection of the actual DMF. A discolored friction surface on the secondary flywheel indicates a heavily overheated or overloaded DMF. This happens when the driver allows the clutch to slip for too long. it may crack at certain speeds and worst-case scenario, total failure can occur. Yellowish discolorations under the friction surface – between rivets, for example – are also a reason for replacement, since the DMF axial bearing is prematurely worn and can cause a noise that you’d hear when driving. Other visible signs of a faulty DMF include both lubricant and fragments escaping from inside the component. Note, however, that slight traces of grease do not pose any problems, as they can be due to the design or approved depending on the vehicle manufacturer and have no influence on the function of the DMF. 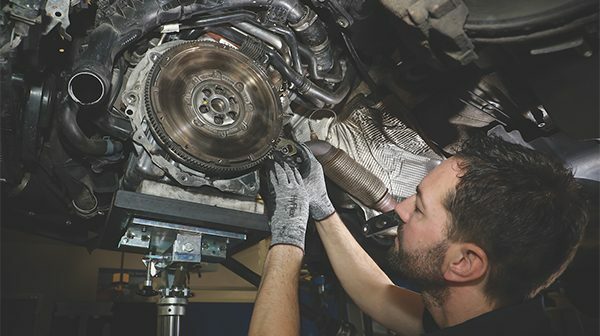 ZF Aftermarket offers its workshop partners a bespoke tool for a quick and professional inspection of Sachs dual-mass flywheels in passenger cars and light commercial vehicles installed or not, preventing damage to a new clutch. It allows you to check the free travel of the torsional damper, the regularity of the torsional damper’s spring force, axial bearing condition and the displacement travel of the radial bearing position. In a fully functioning and properly performing part, all angles and the perceived applied force in both directions should be identical. There should be no unusual movement and it should never stick or rub. Any of the above can indicate defective components inside the DMF, such as broken springs or slide shoes. These may wear through the inside of the DMF housing, allowing lubricant to leak. In these situations, the DMF must be replaced. ZF Aftermarket is a firm advocate of training and provides training courses under the ZF [pro]Tech concept. Trainers deliver theoretical and practical guidance on how to handle ZF genuine spare parts during diagnosis, servicing and repair.